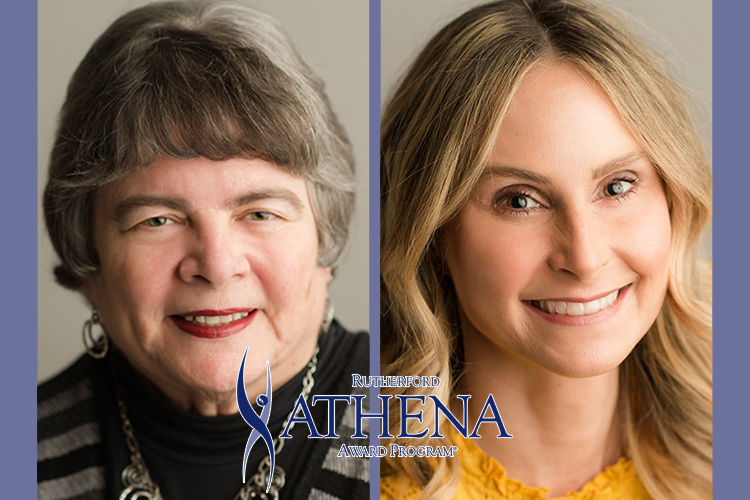 MTSU dancers’ talents burst in..
MTSU's WMOT Roots Radio brings..
A pair of respected MTSU alumnae have been recognized with ATHENA Awards, one of Rutherford County’s highest honors, for their leadership, professionalism and community service. Dr. Linda Gilbert, director of Murfreesboro City Schools and a former professor in and three-time graduate of MTSU’s College of Education, received the 2019 ATHENA Leadership Award and Erin Rains, a family nurse practitioner at Saint Thomas Medical Partners and graduate of the School of Nursing and University College, received the Young Professional Leadership Award from the Rutherford Cable women’s professional development organization April 12. Gilbert, the current Tennessee Superintendent of the Year, earned her Bachelor of Science degree in music and elementary education, her Master of Arts in Teaching in music and her education specialist degree in administration and supervision from MTSU. She also earned a doctorate of education in curriculum and instruction from Tennessee State University. Gilbert has served as the director of schools in Murfreesboro since 2010 and received the MTSU Alumni Association’s 2014 True Blue Citation of Distinction for her achievements in education during its annual Distinguished Alumni Awards. Under Gilbert’s leadership, the Murfreesboro City Schools system has seen drastic improvements, going from School Improvement II status to a statewide Exemplary ACCESS School District and implementing programs to improve student nutrition both in and out of school. She’s also worked throughout her career to create an environment for positive change by helping establish Read To Succeed, Saint Thomas Health’s Ministry in Motion, Prevention Coalition for Success Rutherford County and Rutherford County’s Books from Birth. Gilbert has written and received more than $16 million in grants for schools and community organizations. Rains, a native of Murfreesboro, worked for 14 years as a travel nurse and in critical care nursing before earning her advanced degree as a family nurse practitioner. She’s also offered her knowledge to a variety of professional organizations and to her workplaces, as well as the community, through volunteering, most significantly with Murfreesboro’s Domestic Violence and Sexual Assault Center. As a member of the center’s board and as a domestic violence survivor, Rains saw a way to help victims by providing a safe, private, more comfortable place to perform sexual assault examinations by relocating to a new site. Rains has also helped to create and expand the center’s annual fundraisers, organizing the new Boots & Brews event in 2017 and doubling its attendance in 2018 and revamping the annual Tip Your Waiter luncheon to boost donations. Along with Rains, the 2019 Young Professional Award nominees were Jayme Brunson of MTSU’s James E. Walker Library and MTSU alumnae Courtney E. Chavez of Regions Bank; entrepreneur Becky Lanham, owner of Dance Murfreesboro, The Warehouse and The Remington Room and founder/CEO of Volunteer Rutherford; and Kim N. Page, an MTSU mathematics instructor, plus community leaders Dr. Amy Hodgin, pharmacy manager at Saint Thomas Rutherford Hospital, and Kenzie Keene of the Keene Agency, Farmers Insurance Group of Companies. This year’s ATHENA Leadership Award nominees also included MTSU’s Dr. Yuan-ling Chao, a professor of history; longtime educator Elizabeth McPhee, MTSU’s first lady; and Dr. Barbara F. Turnage, professor of social work and interim associate dean for MTSU’s College of Behavioral and Health Sciences; and community leaders Celeste Middleton, a State Farm Insurance agent; Dr. Mary T. Moss of Tennessee Womens Care; and Gina W. Urban, entrepreneur and marketing consultant. The nominees also included a group of MTSU alumnae: Kristin Coile Demos, director of brand and marketing for Demos Family Restaurants; Judge Lynn England Alexander, administrative law judge and municipal/General Sessions Court judge for the Town of Smyrna; Cherillyn A. Maddox of the Goco Center for Aesthetics; Betsy Maples Taylor, owner and managing broker for Maples Realty and Auction Co.; Judge Donna Scott Davenport, Rutherford County Juvenile Court judge; and Mary M. Wade, former chair of the Murfreesboro City School Board, State Farm retiree and longtime volunteer. Rutherford Cable, which is a chapter of the 40-year-old Nashville Cable, is a decade old and now has more than 250 members. It provides professional and personal development as well as business growth through building long-term relationships, structured networking and referrals. For more information, visit www.rutherfordcable.org.